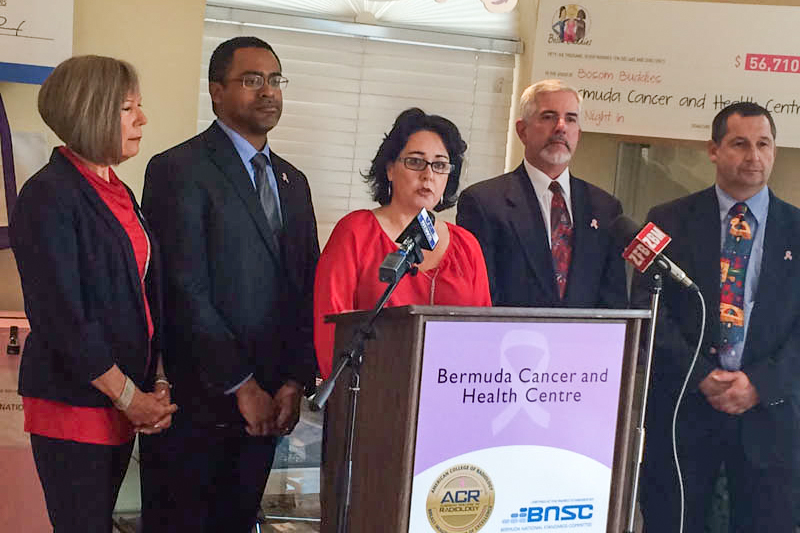 [Updated with video] Bermuda Cancer & Health Centre announced the charity’s plan to introduce Radiation Therapy to Bermuda, saying the benefits include the fact that patients will not need to be off-island for extended periods and the savings to healthcare costs will be $6 to 7$ million per year. The charity said, “In addition to existing cancer treatment services available on the Island, the introduction of radiation therapy will close a significant treatment gap and will result in local “comprehensive cancer care” services. “To understand the cancer burden Bermuda faces we can compare our cancer rates to those in the US, a comparable jurisdiction based on similar socio-economic factors. According to the American Cancer Society, men have slightly less than a 1 in 2 lifetime risk of developing cancer; for women, the risk is a little more than 1 in 3. L to R: Judy White, Board Member, Denton Williams, Board Member, Tara Soares, Executive Director, Glen Gibbons, Board President, Gary Carr, Board Member. “Based on the current Bermuda population we would expect nearly 27,000 people will be diagnosed with cancer during their lifetime. An astonishing number. “Also an astounding number is the number of people in Bermuda who have only basic health insurance or no health insurance at all. An estimated 18% of Bermuda residents or just less than 12,000 residents fall in this category – and they would likely not have access to overseas radiation treatment for cancer. “So why are we now able to bring Radiation Treatment to Bermuda? “There have been significant advances in treatment technology, such that a single machine [or linear accelerator] can be used to treat the majority of cancer. 67% of people diagnosed with cancer will be referred for radiation treatment. Being treated at home means the patient will be surrounded by loved ones and caregivers, such as the PALS nurses• Most patients receiving radiation treatment will cope well with the treatment and therefore will be able to continue to work. Palliative radiation, typically as a result of metastasized bone cancer, will help end of life patients to manage pain. Treatment given locally can be provided at 1/3 of the cost of what local insurance providers are paying for the overseas radiation treatment. The savings to healthcare costs will be $6 to 7$ million per year. “There are many organization and charities which will benefit from the treatment being provided locally and have given Bermuda Cancer and Health their full support towards this important initiative. Local Health insurers, Medical Doctors Association, PALS, Friends of Hospice and the Bermuda Hospitals Board have expressed their support for the introduction of Radiation Treatment. Will insurance costs reflect the huge savings by decreasing? No what this means is that Bermuda Cancer and Health Center can bill for the services. Don’t think that it will be free. What needs to be determined is what is the bang for the buck. How much will be be saving nationally. If the patient was treated overseas for X amount what will the aggregate cost be here for the same amount of treatment. Often treatment in Bermuda is the same or more than the USA. Dialysis for example is ridiculously out of proportion and the Salaries of the Nephrologist are over 20,000 amount for their dialysis not factoring in the cost for consultation. That is insane. So lets see how much they bill for the services. Thank you for your clarification. I stand to be corrected! Well done to all involved who helped to raise the funds for this. Radiation is the cause of ALL cancers. How anyone can think that putting more in you can be helpful is retarded. Look at the stats on how many radiation patients die from radiation and how many GET cancer from their radiation treatment. Also look at the stats of such in relation to chemotherapy, which is another way to kill the masses. Chemotherapy is done using the poison of the Yew Tree, the most powerful poison on earth, and it literally KILLS every cell it contacts when injected. It killed your blood cells, your blood vessels, your tissues, your organs, your skin, etc. Chemo is death in an injection. Like I said, brainwashed masses who pay to be poisoned or irradiated have been successfuly duped. How many millions have died from chemotherapy and radiation would astonish you. More people die FROM chemo and radiation than from the cancer itself! Doesn’t and shouldn’t this be telling you something? Cannabis, however, is the only thing on earth that KILLS cancer. The human body evolved alongside cannabis and we have a cannaboid system which runs our entire body. An intake of cannabis daily ensures an optimal cannanaboid system, which itself is what keeps CANCER FROM FORMING. When you weaken this system, cancer is enabled to form. This truth is scientific fact and upheld by science, not fables from old wives tales regarding devil’s weed. Cannabis is the CURE and was known about since the 70s, but suppressed so the pharmaceutical industry could make trillions. If everyone could grow their own cannabis and use it as medicine, we would have a huge decrease in diseases, conditions, etc that affect our whole population. Cannabis treats over 300 conditions, diseases, etc. What other medicine that is natural can do this? All the chemicals man makes poison us and have side effects like, Blindness, Death, etc. Cannabis cannot harm you in any way, if you smoke it you get smoke in you, but the cannabis will never harm you. Period! Stop ignoring THE CURE THAT WAS HERE ALL ALONG! It is pathetic that the government which I support has essentially spat upon the Cannabis issue, and only legalized virtually useless forms of cannabis chemicals probably synthetic and unnatural. What needs to be done to eliminate cancers and prevent them is the UTTER legalization of the MEDICINAL PLANT CALLED CANNABIS. Stop pretending cannabis does not kill cancer and treat and heal over 300 ailments. Stop pretending cannabis has not saved millions of lives. What kind of alternative is POISON AND RADIATION? Good LORD!